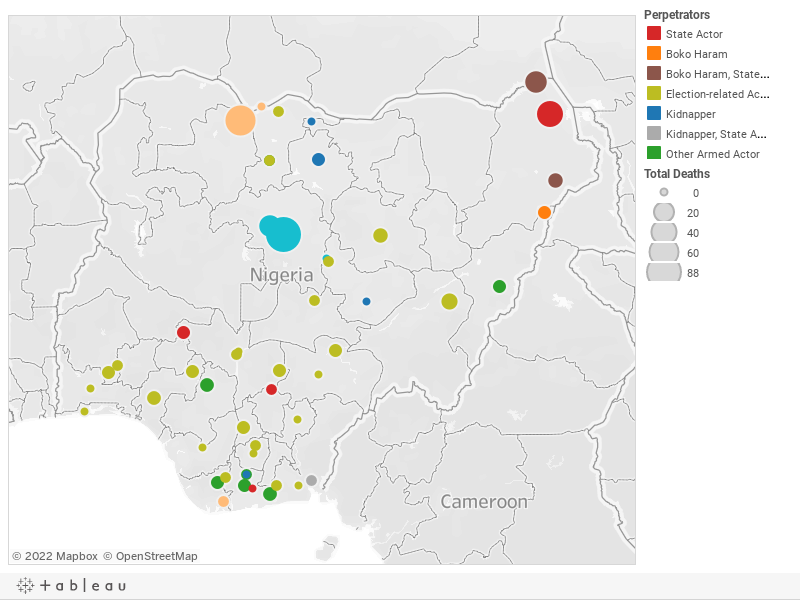 Below is a visualization and description of some of the most significant incidents of political violence in Nigeria from March 9 to 15, 2019. This update also represents violence related to Boko Haram in Cameroon, Chad, and Niger. These incidents will be included in the Nigeria Security Tracker. March 9: Nigerian troops killed twenty-three Boko Haram militants in Abadam, Borno. March 9: Electoral violence resulted in two deaths in Ibadan South-West LGA and one death in Lagelu LGA, Oyo. March 9: Electoral violence resulted in one death in Ahoada West LGA, two deaths in Ogba/Egbema/Ndoni LGA, and four deaths in Khana LGA, Rivers. March 9: Gunmen killed a policeman and abducted twenty Independent National Electoral Commission (INEC) ad hoc staff in Danusa, Katsina. March 9: Electoral violence resulted in one death in Kankara, Katsina. March 9: Electoral violence resulted in two deaths in Akoko South-West LGA and four deaths in Odigbo LGA, Ondo. March 9: Electoral violence resulted in one death in Igboeze North, Enugu. March 9: Electoral violence resulted in two deaths in Idemili North, Anambra. March 9: Six INEC staff were kidnapped, then released in Lokoja, Kogi. March 9: A ballot box snatcher was killed in Ukanafun, Akwa Ibom. March 9: Electoral violence resulted in two deaths in Guma, Benue. March 9: Electoral violence resulted in one death in Ughelli South, Delta. March 9: Electoral violence resulted in one death in Nkwerre, Imo. March 9: Bandits killed four and kidnapped "several" (estimated at five) in Isa, Sokoto. March 9: Electoral violence resulted in one death in Olamabor LGA and two deaths in Ankpa LGA, Kogi. March 9: Bandits killed one in Kajuru, Kaduna. March 9: Electoral violence resulted in one death in Akwanga, Nassarawa. March 9: Pirates kidnapped five sailors off the coast of Brass, Bayelsa. March 10: Bandits killed thirty-five in Kajuru, Kaduna. March 10: Two suicide bombers killed themselves but no others in Madagali, Adamawa. Boko Haram was suspected. March 10: Fifteen were kidnapped from a bus in Ikwerre, Rivers. March 11: Bandits killed fifty-two in Kajuru, Kaduna. March 11: Troops killed "several" (estimated at five) Boko Haram militants in Bama, Borno. February 15–March 11: Over the last month fifty-five bandits, three soldiers, and one vigilante were killed during continued military operations in and around Zurmi, Zamfara. March 12: Bandits killed twenty-two in Birnin Gwari, Kaduna. March 12: Gunmen killed a driver and kidnapped a Lebanese man in Kano, Kano; they later killed the kidnapped man on March 14. March 12: Bandits killed one and kidnapped three in Kankara, Katsina. March 12: Gunmen attacked a police station and killed four policemen in Owan East, Edo. March 12: The Multinational Joint Task Force (MNJTF) claimed to have killed thirty-nine Boko Haram militants in Kukawa, Borno. March 12: Post-election violence resulted in eight deaths in Jalingo, Taraba. March 12–14: Post-election violence resulted in five deaths in Bauchi, Bauchi. March 14: Gunmen abducted a renowned Quranic reader and five others in Kankara, Katsina. March 15: Gunmen killed two policeman in Yenegoa, Bayelsa.